Norway did not wish to give former President Chandrika Bandaranaike Kumaratunga a copy of a confidential letter it wrote to Velupillai Prabhakaran, the late leader of the Liberation Tigers of Tamil Eelam (LTTE), during the ceasefire period. The reason - passing a copy would be like giving it to Sunday papers, Norway's then Ambassador to Sri Lanka, Hans Brattskar had reportedly told the US Charge' d' Affaires in Sri Lanka, James Entwistle. "Norwegian FM (Foreign Minister) Petersen and DFM (Deputy Foreign Minister) Helgesen passed a letter to LTTE leader Prabhakaran (text below). At GSL request, EU missions in Colombo will recommend to Brussels that the EU designate the LTTE as a terrorist organization. "Brattskar noted that he was not sharing a copy of the Prabhakaran letter with the GSL (Government of Sri Lanka) since that was not normal practice. Moreover, the contents of Petersen and Helgesen´s Monday night meeting with President Kumaratunga had clearly been leaked to the Colombo press ("Vidar is hopping mad! "), so passing a copy to the GSL would be "like giving it to the Sunday papers," Brattskar mused. He asked that the U.S. not share the letter. "Brattskar said that Balasingham had promised Petersen and Helgesen he would translate and transmit the letter to Kilinochchi immediately. Balasingham had expressed concern over recent LTTE actions in the North and East but had danced around the question of responsibility for Kadirgamar´s assassination (and disavowed any prior knowledge). Balasingham, Brattskar said, had been pleased at the prospect of receiving the Norwegian FM and at the idea of more direct Norwegian contact with Prabhakaran (although Balasingham said he would want to be present at any such meetings as he usually has in the past- Brattskar said the Norwegians have only met Prabhakaran once when Balasingham was not present). "Balasingham did not discuss travel plans to Sri Lanka but Brattskar noted that when he had seen Balasingham in London in July, the LTTE theoretician had said he was thinking about travel to Kilinochchi in October. Brattskar undertook to advise Charge´ as soon as the Norwegians had some reaction to the Prabhakaran letter. He noted that as far as he knew a Petersen/Rice conversation was still scheduled to take place this week. The Norwegians, Brattskar concluded, continue to like the idea of a September co-chairs meeting in New York although, given Japanese sensitivities about their standing invitation to host the next meeting in October, the New York meeting should perhaps be billed as something like a preparatory meeting. "On a related topic, the British DCM told Charge´ August 18 that the GSL had just convoked her High Commissioner (as holder of the EU Presidency in Colombo) and the EC Charge´ to ask that the European Union list the LTTE as a terrorist organization (apparently there is a mechanism through which the EU can designate terrorist organizations on a union-wide basis in addition to whatever procedures individual EU members states may have). "The EU missions in Colombo plan to endorse the idea strongly to Brussels. The British DCM said she is familiarizing herself on the details of the procedure and the potential timeline for such listing. "As I am sure you realize, the peace process is now in a critical situation. The killings and counter-killings over the last few months have been watched with mounting concern by Norway and the international community. Along with the continued recruitment of children to the LTTE, this has created distrust about the LTTE´s intentions as regards the peace process. "The assassination of Foreign Minister Lakshman Kadirgamar has exacerbated the situation. It is not up to Norway to draw conclusions about the criminal investigations now under way in Colombo, or on any other judicial matter in relation with the killings. However, public perception both in Sri Lanka and internationally is that the LTTE is responsible. This public perception is a political reality. The LTTE needs to respond to this situation in a way that demonstrates continued commitment to the peace process. "I see it as my obligation to make clear to you the political choice now facing the LTTE. If the LTTE does not take a positive step forward at this critical juncture, the international reaction could be severe. "1. To accept the Norwegian Government´s invitation to participate in a review of the implementation of the Ceasefire Agreement in order to find practical ways of ensuring full compliance by both parties. "2. To establish direct communications between the LTTE and the Sri Lankan Army in the east, in order to improve security. "3. To accept without delay the Sri Lanka Monitoring Mission proposal for transportation of LTTE cadres. "4. To collaborate in a practical way with government initiatives to speed up reconstruction in the north and east. The LTTE´s continued commitment to the P-TOMS agreement is vital in this regard. "5. To take effective steps to halt killings and to cease the recruitment of underage combatants. "I trust that you appreciate the gravity of the present situation and will take steps to demonstrate to the international community that the LTTE is committed to the peace process. The director of a state-run hospital has become the cynosure of all eyes, even doctors and patients. As the chairman, a retired bureaucrat, watched helplessly, the man who has more to do with the deep seas than health or medicine is visiting all parts of the hospital. Well, that is not a forbidden task, one would say. However, two private bodyguards accompany the man on his daily rounds. Just a week ago, he visited the hospital kitchen to inspect the quality of food and question staff there. The two guards stood on either side of the director as he fired one question after another to the terrified kitchen staff. They are the only guards who are not stopped at the gate or at entry points manned by a private security firm. External Affairs Ministry officials had to engage in some friendly persuasion with their counterparts in Pakistan to avoid what may have been an embarrassing event. A herd of thoroughbred Pakistani buffaloes, yielding anything between 20 to 25 litres of milk each, were to be flown from Islamabad to Colombo in a Pakistan Air Force C-130 transport plane. They were to be on hand when President Asif Ali Zardari visited Colombo last month. The buffaloes were to be handed over to a Sri Lankan VIP at a formal ceremony. However, EAM officials felt such a ceremony where a Sri Lankan VIP would take charge of buffaloes would not be viewed well by their fellow countrymen. Islamabad readily agreed to cancel the VIP flight for buffaloes. President Zardari has come and gone. However, the buffaloes are now arriving in Sri Lanka by ship. 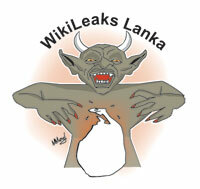 A Sri Lankan group based in Hong Kong has taken a leaf from Julian Assange's Wikileaks exposures. A Hong Kong based website titled srilankaleaks.com is to make its debut next week. The same group currently operates another website. Their sponsors say they will not only post Wikileaks material relating to Sri Lanka appearing in a number of other mirror websites. They are also to call upon Sri Lankans to send them secret material to a confidential site. They are to be uploaded in the srilankaleaks.com. Only last week we reported how President Mahinda Rajapaksa was unable to travel for the funeral of the Royal College Principal's mother at Baddegama due to bad weather and had to take a special fixed wing flight back to Colombo. Last Tuesday, the President was the chief guest at the passing out of 253 cadet officers of the Sri Lanka Army at Diayatalawa. When the ceremony was over, he could not return to Colombo. Air Force VIP pilots said weather conditions were not too good for takeoff. He had to stay the night at the military installation and return to Colombo by helicopter on Wednesday morning; the travels and travails of a President. May be you could go up in flames!